We all know that most sci-fi movies don't actually use real physics or science rules and often exaggerate for entertainment purposes. Just think of Armageddon and you will understand. 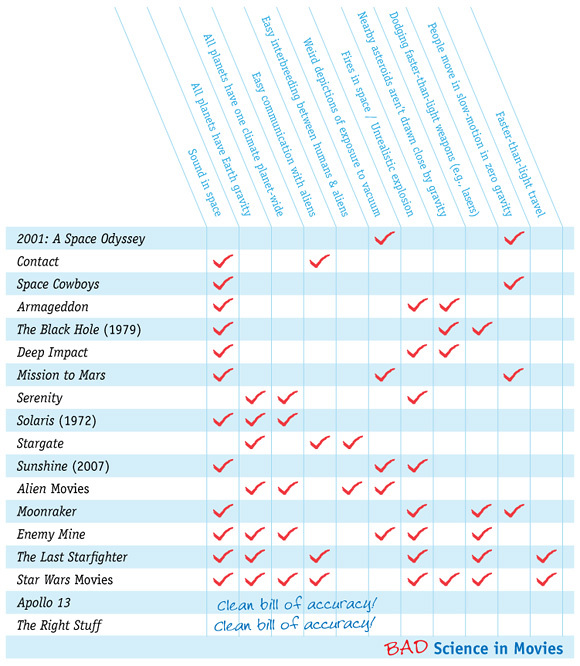 There's always a debate about which movies do use proper science and which don't, so Charlie Jane Anders from io9 (originally via I Love Charts) decided to create their own "chart" of Bad Science in Movies. It's basically a big checklist/graph with 18 movies cross-listed with 11 different rules that were broken, such as "sound in space" and "moving in slow-motion in zero gravity", which is supposedly one rule that 2001: A Space Odyssey broke. See it below! Some Armageddon hilarity: "Half of the Earth's population will be incinerated by the heat blast, the rest will freeze to death in a nuclear winter. Basically the worst parts of the Bible." I'm actually quite surprised to see Ron Howard's Apollo 13 and Philip Kaufman's The Right Stuff being the only two movies that didn't break any rules, which is not-so-coincidental after all because they're also based on real occurrences in our history so it was a lot easier for them to recreate the exact scenarios. It's also interesting to see Star Wars with the most checks, but it's more of a space fantasy within its own universe, so I'll let it slide. Thoughts? Its not the bad science that makes a bad movie. And Star Wars is a Spece-opera, not a really sci-fi. Also... were is Star Trek? So basically, for the most part, in order to not completely bore your audience to death, you have to break a lot of scientific rules. I'm okay with this. am with Dave where the hell is star trek?? Yeah Star Wars isn't sci-fi. You could literally replace every object in that universe with fantasy objects and get the exact same story. Riding horses instead of X-Wings, Sea Ships instead of star destroyers, Darth Vader is a black knight literally, Emperor Palpatine is a wizard...there is a main hero who has a singular transformational quest. That list is bull... At least for 2001. It's depiction of vacuum exposure is realistic. As for moving in slow motion in zero-g - Has the author of this ever seen astronauts EVA's zip around??? the serenity part is not quite accurate, since they mention that many planets have been "terra-formed", which enables living conditions similar to those on earth on the treated planets. this might not explain the part about them having gravity identical or similar to earth's, but it would seem reasonable that only a planet with basic properties, such as mass, that are similar to earth's could be terra-formed. additionally, the part about explosions being inaccurate is debatable, since the ships features and equipment, among them oxygen-tanks required for long trips, and type of fuel, would influence combustion and explosion. just sayin'. Matt. If they were similar to Earth then they would still have variable ecologic regions...What this is saying is that the planets as wholes, have only one distinguishable environment, which is true of Serenity...each planet is like "a desert planet" actually most all planets in "serenity" are desert planets, or "city planets"...same with it's show "firefly"
One other thing: When spaceships meet in space (where else?) their up- and downsides are always pointed in the same direction as of the respective other ships, allthough there is no gravity in space and therefore no upside and downside outside of the said spaceships. Hey number 9, Somewhere in the TV show they mentioned that terraforming wasn't an exact process and they usually ended up with desert like planets especially in the outer rim where no one really cared. The deserty environment was supposed play into the whole "wild west/post civil war" motif the show made. Sci-Fi is Science FICTION peeps. This should be listed as a bad topic. Who ever made this is lame and as 17 stated, nerds. Get fictional folks... thats what these movies are. 13/17/18 I couldn't agree more! None of this is real people!! These are MOVIES!!! Who cares! What a BS list, let's start by saying: 1) Star Wars is not a scifi but a fantasy movie. Having it off the list lets move to Contact: 2) It has sound in space? No character was ever in vacuum in this movie (it was a capsule that has air inside and transparent walls). 3) Easy communication with aliens: Aliens recreated images and way-of-thinking from the memory of the main character, that alone requires learning the language first. So yeah - aliens knew English because they can read data off freaking brain cells. And yes - it _was_ probably easy for them, which is totally understandable, knowing they are millions of after the "science" revolution, which we have had only just about under 200 years ago. The rest: 4) Where is Star Trek? 5) Stargate series have sound in space. It's a movie list though, so I'm willing to let this one pass. 6) Stargate's are not natural phenomena - they were put on the class-m planets by the ancient race, that's why they are all Earth-like. 7) Stargate "aliens" all are homo-sapient (descendants oh the "ancient race"), that's why there is no such thing as alien-human interbreeding. -- You made a checklist of "bad science" in movies without doing any actual research into each checked in/out item. If there was a chart of bad checklists, your work would be on it, #1. Can I just add that it's "Science FICTION" not "Science NON-fiction"